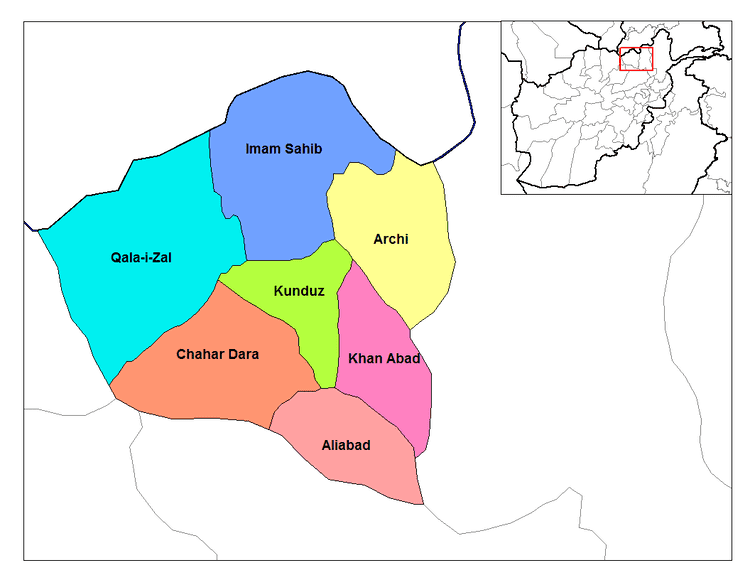 Kunduz (Pashto/Persian: کندز‎‎) is one of the 34 provinces of Afghanistan, located in the northern part of the country next to Tajikistan. The population of the province is around 953,800, which is multi-ethnic and mostly a tribal society. The city of Kunduz serves as the capital of the province. 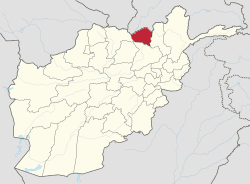 The Kunduz Airport is located next to the provincial capital. 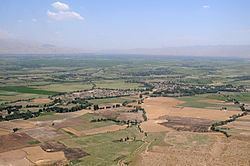 The Kunduz River valley dominates the Kunduz Province. The river flows irregularly from south to north into the Amu Darya river which forms the border between Afghanistan and Tajikistan. A newly constructed bridge crosses the Amu Darya at Sher Khan Bandar. The river, its tributaries, and derivative canals provide irrigation to the irrigated fields that dominate land usage in the agricultural province. There are also rain-fed fields and open range land that span several miles. The area has been part of many empires in the past. It became part of the Afghan Durrani Empire in the mid-18th century. It saw major migration from Russian Turkestan in the north during the early 1920s. During the governance of Sher Khan Nasher, Kunduz became one of the wealthiest of Afghanistan's provinces, mainly due to Nasher's founding of the Spinzar Cotton Company, which continues to exist in post-war Afghanistan in the early 20th century. One senior (U.S.) intelligence analyst told me, "The request was made by Musharraf to Bush, but Cheney took charge—a token of who was handling Musharraf at the time. The approval was not shared with anyone at State, including Colin Powell, until well after the event. Musharraf said Pakistan needed to save its dignity and its valued people. Two planes were involved, which made several sorties a night over several nights. They took off from air bases in Chitral and Gilgit in Pakistan's northern areas, and landed in Kunduz, where the evacuees were waiting on the tarmac. Certainly hundreds and perhaps as many as one thousand people escaped. Hundreds of ISI officers, Taliban commanders, and foot soldiers belonging to the IMU and al Qaeda personnel boarded the planes. What was sold as a minor extraction turned into a major air bridge. The frustrated US SOF who watched it from the surrounding high ground dubbed it "Operation Evil Airlift." Another senior U.S. diplomat told me afterward, "Musharraf fooled us because after we gave approval, the ISI may have run a much bigger operation and got out more people. We just don't know. At the time nobody wanted to hurt Musharraf, and his prestige with the army was at stake. The real question is why Musharraf did not get his men out before. Clearly the ISI was running its own war against the Americans and did not want to leave Afghanistan until the last moment." On 4 September 2009 the German commander called in an American jetfighter, which attacked two NATO fuel trucks, which had been captured by insurgents. More than 90 people died, among them at least 40 civilians, who had gathered to collect fuel. The port of Sher Khan Bandar provides an international outlet for Kunduz's goods and has allowed for importing commercial goods from Asia, Middle East, and the Persian Gulf. Although a reliable census has not been carried out, the population of Kunduz province is estimated to be around 953,800. The province is multi ethnic and mostly rural. The ethnic groups that inhabit the province are as follows: Pashtun 34%; Uzbek 27%; Tajik 20%; Turkmen 9.4%; Arab 4.6%; and Hazara 3.5%; plus small groups of Pashayi, Baloch and Nuristani. About 94% of the population practice Sunni Islam and 6% are followers of Shia Islam. 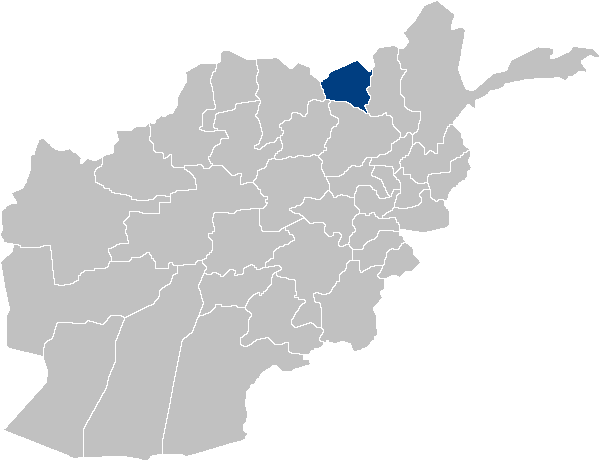 The major languages spoken in the area are Dari, Pashto, and Uzbeki.